Trying to decide what gift to send people? 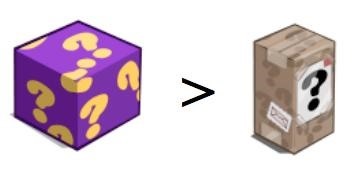 I'm here to tell you that if your neighbor is not building something, the Special Delivery package is pretty much useless! Sure, its good for bees, but if that's full too (think of your higher level neighbors and those with lots of friends) they don't need it! 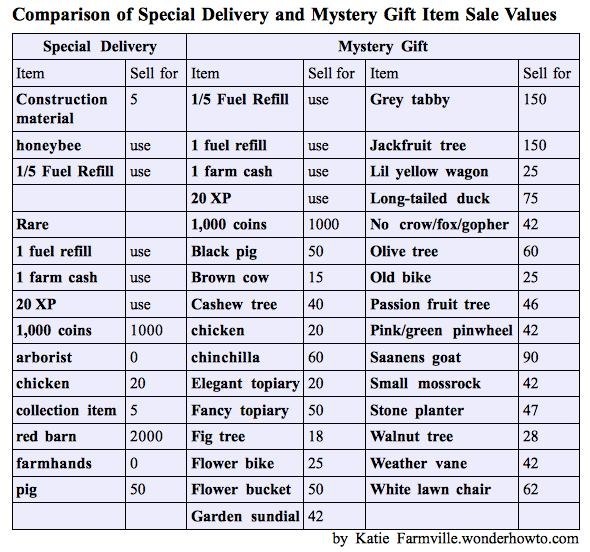 Check out this chart I made to see the difference in the possible gifts. Keep in mind that anything good from the delivery package is EXTREMELY rare. I've opened a couple hundred of them and never gotten anything other than building supplies, bees, and 1/5th fuel. Sell for values courtesy of Farmviller.com. There may be more or less available items in these gifts but the idea is still generally the same. So what should I send? Send Magnolia or Mangrove tree as those sell for 250 consistently. If you're level 90+ go for the Dutch Rabbit. If your neighbor really needs a certain gift, they can post a wish for it from inside their gift box! Like this? You can share it on Facebook and make sure you join our page for more updates and tips! I've gotten Free Farm Cash out of a few of the Special Delivery Packages that I've received. Sure, it's a rare occurrence, but it has happened (at least for me ).